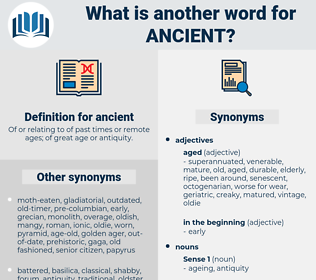 What is another word for ancient? Of or relating to of past times or remote ages; of great age or antiquity. antiquated, immemorial, long-established, time-honoured, old-fashioned, traditional, vintage, outdated, long-time, millennial, dilapidated, historic, distant, classic, former, old-growth, prestigious, primitive, old-style, obsolete, secular, monumental, longtime, stale, archaelogical, long-outstanding, patriarchal, original, existing. ancestral, longstanding, archaic, centuries-old, time-honored, erstwhile. full-scale, unworn, juvenile, infantile, modish, advanced, full-blown, callow, higher, underage, future, untested, Evolved, late, novel, babyish, raw, fresh, childlike, preteen, unused, fashionable, full-fledged, ageless, stylish, minor, green, childish, untried, developed, Infantine, present, brand-new, complex, latest, inexperienced, vernal, high, immature, kiddish, puerile. Never mind about ancient history now. The bird on the pole was very ancient. anaconda, amazement, announcement, amusement, amazon ant, anisogamete, anise-scented. old person, mortal, oldster, soul, person, individual, golden ager, senior citizen, somebody, someone.